Armed Forces (army, navy, airforce) Veterans are chary of going public on defence matters particularly on issues of their own rights and entitlements. This is because of years of service in a strict disciplinary environment under the Army, Navy and Air Force Acts of Parliament, which expressly deny them the fundamental rights of freedom of speech & expression. Thus there was a time when Veterans believed in staying out of the news. But times have changed. Politicians and bureaucrats have tested the Veterans' patience. The demand for One-Rank-One-Pension (OROP) dates back to the 1980s. Nothing much happened until the Congress promised OROP in its poll manifesto in 2004, but the UPA government rejected the OROP demand in December 2008, resulting in Veterans returning over 22,000 gallantry, war and service medals to the President of India along with symbolically signing a letter with their own blood in 2009. Under the Indian Ex-Servicemen's Movement (IESM) banner, Veterans have been taking delegations to the Ministry of Defence, writing letters to the Prime Minister and Defence Minister, and holding peaceful and dignified rallies and public demonstrations. With continuing pressure from MP Shri Rajeev Chandrashekhar and IESM, the the Parliament Standing Committee on Defence studied and accepted the concept and definition of OROP in 2013. OROP was featured in the UPA government's budget in February 2014 and was reflected in an executive order to that effect in the same month. After the BJP-NDA government came to power, granting OROP was mentioned in the budget speech in July 2014, and the MoS for Defence confirmed it in the Rajya Sabha in December 2014. During the campaign for the 2014 general elections, BJP PM candidate, Shri Narendra Modi, made a promise at a Veterans' Rally in Rewari, Haryana that, if elected to office, he would ensure OROP. In March 2015, during PM Modi's much-hyped visit to the troops on Siachen glacier, he volunteered the statement that the OROP demand would be fulfilled. However, even after two successive governments have agreed to OROP, and the PM's promises on its implementation, Veterans see OROP as a distant and receding light at the end of a tunnel. 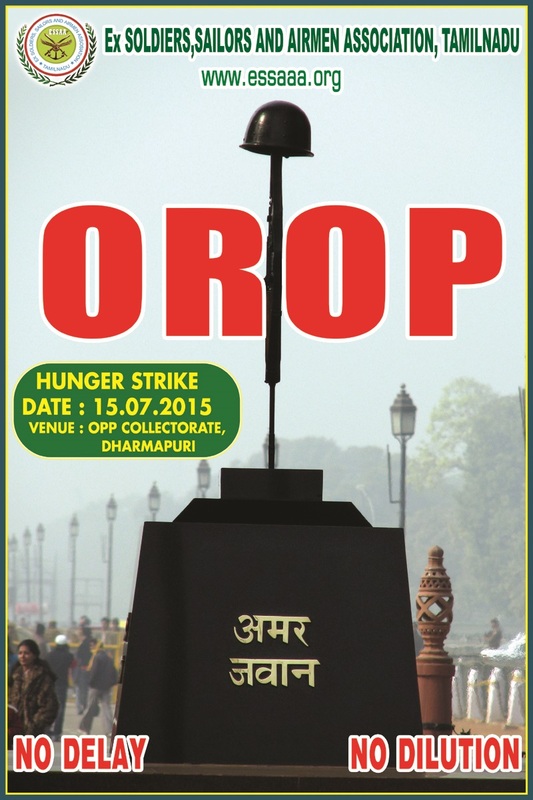 What is the fuss about OROP? But first, what is OROP? OROP simply means “uniform pension for military personnel retiring in the same rank with the same length of service irrespective of their date of retirement, and any future enhancement in the rates of pension be automatically passed on to past pensioners”. The reason for demanding OROP is that Veterans who have retired earlier receive much less pension than those who retired more recently. It can be argued that this also happens in other government jobs, so why are Veterans making such a fuss? To answer this perfectly valid question one needs to know some little-known facts concerning the military, at least insofar as service, retirement and pension are concerned. One, Armed Forces (AF) personnel are compulsorily retired at a very early age, and retirement age depends upon their rank. Early retirement is necessary to “keep the army young” because older men cannot fight battles which make huge demands on stamina and strength. Soldiers (Sepoys, or in general, Jawans) who have not been promoted to NCO or JCO rank retire compulsorily after just 15 to 17 years of service, when their age is 35 to 37 years. Sepoys who are promoted as NCOs or JCOs retire at age 45 to 47 years. Officers compulsory retirement age is connected with rank as follows – Major-50, Lt Col-52, Col-54, Brig-56, Maj Gen-58, Lt Gen-60, General-62, noting that promotions depend both on performance and severely limited vacancies due to the rigid pyramidal rank structure. That is why, of all AF retirees, soldiers constitute about 90%. Two, a soldier who was retired, say, in 1986 would receive pension on the basis of his salary according to the Fourth Pay Commission, while the pension of a soldier who was retired after the Sixth Pay Commission (20 years later) would be considerably higher because successive Pay Commissions fix salaries according to the rising cost indices. Thus, a Havildar (NCO) who retired earlier with over 20 years of service may receive less pension than a soldier who retired later with only 15 years of service. As an example for the officer cadre, the pension of a post-2012 retiree Colonel was Rs.35,841, whereas a pre-2006 retiree Major General’s pension was Rs.26,700. These disparities are grossly unfair because the soldier is retired compulsorily at an age depending upon his rank, and his pension is fixed upon the pay according to the CPC in force at retirement. Three, compulsory retirement after just 15-17 years of service at age 35 years means that the soldier is effectively denied salary earnings of 25 years which other government employees (including the police forces) receive because they retire at age 60 years. There is negligible scope for lateral entry into government service even for soldiers who retire without disability attributable to military service. He is forced to seek employment to supplement his meagre pension at a time when his family and other commitments are just beginning to increase. This, along with lower pension of earlier retirees is a combination which makes for near-destitution of a soldier who served in hard conditions to defend the nation. For comparison, a CRPF policeman retires at 57 years age, and CRPF authorities are pressing for the retirement age to be increased to 60 years. Four, there are huge differences in the military officer cadre vis-a-vis IAS and IPS. Consider the rank of Maj Gen, to which only 0.8% of officers get promoted because of the command-control-discipline rank structure of the army, after about 30 years of service. But the equivalent rank (in terms of salary) in the IAS is Joint Secretary (JS), which 100% of IAS cadre attain after only about 18 years of service, and about 80% of IPS cadre after about 20 years. It is this unfairness in parity in addition to early retirement age which is at the root of the OROP demand. Further, and even more unfairly, the Jawan is equated with a Class D government employee. There has been much discussion regarding what OROP would cost the exchequer. Many opined it was unaffordable, and further that other government servants would also demand OROP if granted to Veterans. However Veterans maintain that OROP cannot be withheld from them because some others, whose conditions of service and promotions are entirely different, also demand OROP. MoD sent the final proposal to implement OROP for Rs.8,300 crores to Ministry of Finance on 17 February 2015. Adding Rs.8,300 crores to Rs.43,000 crores of Defence pensions, the total is Rs.51,300 crores per annum. Veterans argue that when the BJP-NDA budget allowed Rs.5.72 lakh crores as “revenue foregone” to provide concessions on corporate tax, commercial tax & customs duties to business houses for just one year, hesitating at spending less than one-tenth of it on Veterans who have given the best years of their lives for the nation's defence was a deliberate slight. There was no member in 6CPC and earlier CPCs to represent soldiers, who form not merely the single largest segment affected by the decisions of 6CPC, but also form the only segment that is denied fundamental freedoms under Articles 19(a) and 19(c), and have conditions of service, promotion and retirement that are adverse when compared with other categories under consideration of the 6CPC. The Department of Ex-servicemen Welfare (DESW) was set up in 2004 within MoD, to formulate policies and programmes for the welfare and resettlement of Veterans. However, without a single serving soldier or Veteran in its setup, it has actually been working at cross purposes with Veterans' welfare. Factually and outrageously, as a matter of policy DESW contested all cases won by individual Veterans in courts of law, including one case concerning a paltry Rs.702 per month won by a disabled soldier after litigating in a High Court. A large section of the public including legislators, are ignorant of soldiers' working conditions – early retirement, non-family stations and long separations, continual life-threatening stressful situations, risks on-the-ground and in-the-field, high casualty rate, strict disciplinary regime under military law, denial of fundamental rights, etc. The tragedy is that they are not even interested in knowing, let alone understanding. After promises have remained unimplemented, very recently PM Modi made a statement that OROP was not clearly defined. This raised doubts among Veterans regarding which vested interest has sown this “doubt” in the PM's mind, though most believe that these are IAS-sourced machinations. This belief is supported in large measure by the composition and conduct of successive CPCs and the attitude and manner of functioning of the Department of Ex-Servicemen's Welfare (DESW) under MoD, outlined earlier. Veterans hold Mr. Modi accountable to promises made as PM-candidate and later as PM. Sensing the growing disappointment and anger among Veterans, the PM is reported to have tweeted that Veterans have waited 40 years and should not mind waiting a little more to solve the OROP muddle. 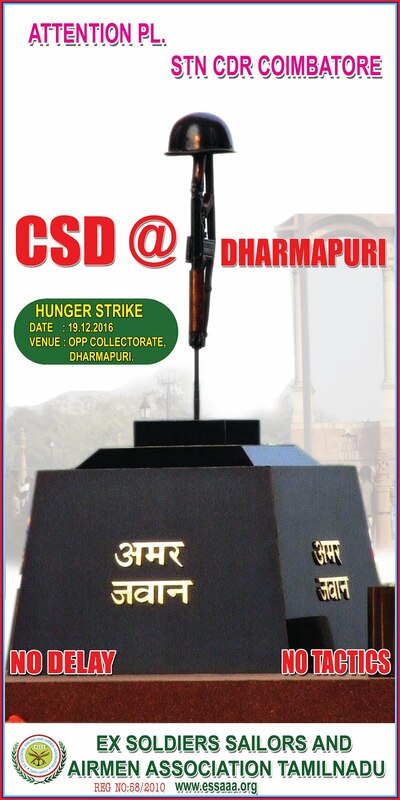 IESM has demanded that government commit a definite date by which OROP would be implemented, failing which a peaceful, dignified Maha-Rally would be held on Sunday 14 June 2015 at Jantar Mantar, New Delhi, with simultaneous rallies in some state capitals and other cities with a large Veterans' presence. This is to be followed by an indefinite relay fast starting 15 June. Government's continued neglect of veterans is actually a double whammy on the country. On the one hand, valuable trained manpower is being lost, and on the other hand impecunious soldiers are joining the ranks of the unemployed or under-employed and exacerbating the current high levels of country-wide discontent. It does not take a rocket scientist to understand that OROP is a matter of simple justice. Some Veterans say that governments playing with their patience at the behest of vested interests that delay or deny OROP, are figuratively playing with a bomb with a slow-burning fuse. Only time will tell whether the Maha-Rally will result in grant of OROP, or whether the vested interests succeed in destroying the bond between the soldier-veteran on the one hand and the government on the other.